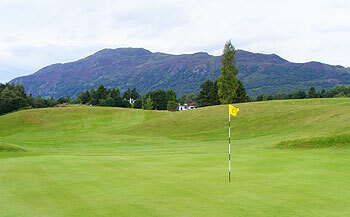 Newtonmore Golf Club celebrated its centenary in 1993 so golf has been played here for well over a hundred years. Many improvements have been made to the original 9-hole Old Tom Morris course over the years, which Tom Turnbull extended to 18 holes in 1902, and visitors can look at original plans of the course on the clubhouse walls to see what changes have been made. The club is not resting on its laurels either as a program of tee modifications is in place to ensure that Newtonmore keeps pace with the modern game. The two opening and closing holes are laid out on undulating land in front of the clubhouse whereas holes 3 to 16 are routed on lower lying land alongside the banks of the River Spey. All eighteen holes are surrounded by sensational Highland scenery – which is often an additional hazard for the visitor trying to concentrate on their game! The overall length of the course is 6,031 yards with a par of 70. There is only one par five on the card, the 513-yard 10th hole called “The Acres.” With water and out of bounds all the way down the left, the line from tee to green is the highest point of Creagdhu in the background. One interesting fact about the membership at Newtonmore is the high number of left handed players who play golf here – something in the water, you ask? No, it’s due to the double handed nature of playing shinty – at which Newtonmore has a proud Highland tradition – and young boys and youths become adult golfers who can wield the golf sticks either way! And, when Newtonmore built an extension to the clubhouse a few years ago, the man to open the building was none other than Bob Charles, the only left handed player to win the Open (1963). Snow was covering the Cairngorms and it was 'gey dreich' when I played here. After two poor opening holes (didn't know which way to drive at the 2nd!) things improve at the excellent 3rd. The 6th is also a fine hole but there is a similarity between many of the holes on the back nine. The last green poses an 'interesting' challenge. As a stop-off on the way to more demanding courses further north you could do worse. And the scenery is pretty! I played here on the way north to Lossiemouth to break up the trip from Glasgow (I might do the same at Kingussie next time) and it was a lovely way to spend a morning golfing. The course measures only 5490 yards from the gents yellow tees so you will not be challenged off the tees – if you cannot play to handicap around here then CONGU should step in and revoke your accreditation! It’s a really nice wee track with lots of pleasant holes, the best of which on the flat stretch between 3 and 16 is the left doglegged 6th, called “Strone Dell,” where a burn guards the front of the putting surface. The home hole is played semi blind to a punch bowl green in front of the charming little clubhouse and is an appropriate way to finish a round that will have you smiling all the way to your next golfing port of call.